Dometic TWCV 24 Titan compact modular chillers use titanium condensers to greatly increase durability and product lifespan. Titanium is unaffected by the punishing combination of saltwater, invasive marine life, and the harsh acids used for routine cleaning of the condenser coil. Titan service life is greatly extended compared to cupronickel systems–the industry standard–which inevitably suffer catastrophic failure from corrosion and erosion in the harsh marine environment. 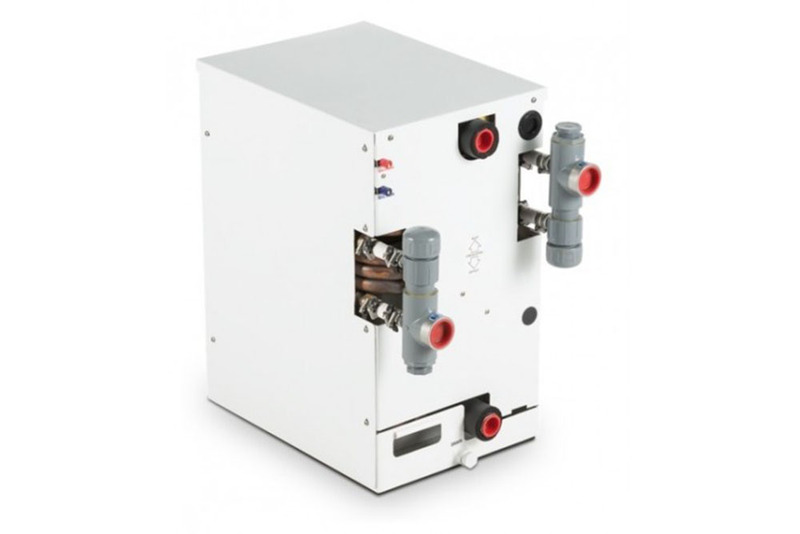 Each unit includes a chilled water (CW) flow switch, refrigerant high- and low-refrigerant pressure switches, and inlet and outlet CW temperature sensors. The TWCV does not include a chilled water modulating flow control, which means air handlers with or without flow controls can be used. On larger boats we always recommend using flow-controlled air handlers to ensure proper water distribution. A balancing flow control (BFC) is not needed when using TWC chillers. Dimensions product depth: 28 "
Dimensions product height: 31 "
Dimensions product width: 25 1/4 "